Russian police have taken into custody an Azeri man suspected of killing an ethnic Russian last Thursday. 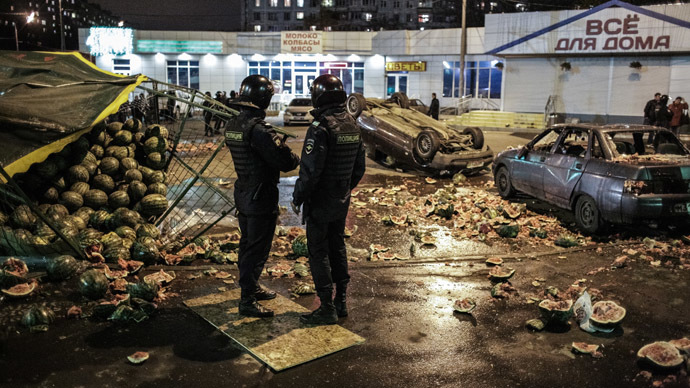 The murder sparked Moscow’s worst rioting in three years. Officers detained 276 people on Tuesday in an attempt to prevent a new anti-migrant rally. 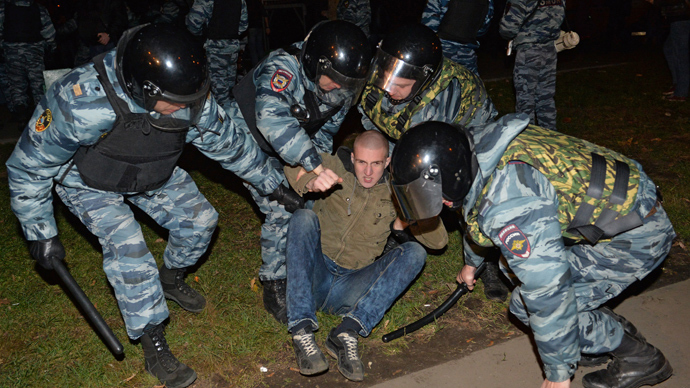 Almost 300 people – about a third of them minors – were detained in southern Moscow on Tuesday evening. They were all released soon after. Group of people gathered near Prazhskaya Metro station on Tuesday evening planning to stage a nationalist march in Western Biryulyovo. The district where Sunday’s unrest took place became the scene of the worst rioting in the capital in almost three years. It comes as Muslims in Russia celebrate one of the main Islamic holidays, Kurban Bayram, or Eid al-Adha, with mass prayers in the city center. Nationalists dubbed their unsanctioned rally "Our Response to Kurban Bayram." Earlier on Tuesday, police apprehended Orkhan Zeinalov, 30, in the town of Kolomna, located about 100 km from Moscow. The Azerbaijani national is suspected of stabbing to death a 25-year-old Muscovite, Egor Shcherbakov, last Thursday. According to a source who spoke to RIA Novosti, Zeinalov acknowledged his guilt in a conversation with investigators. 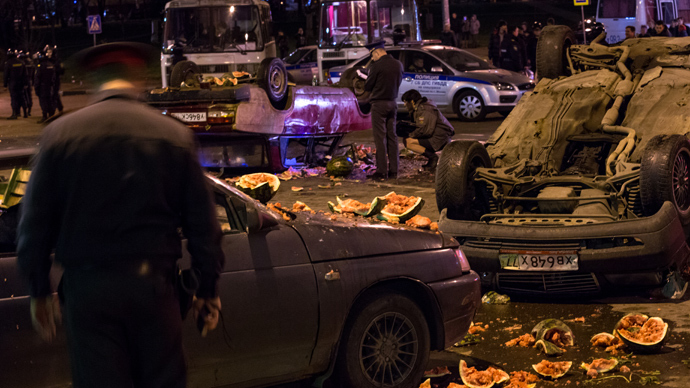 The murder sparked public outrage and mass protests in Moscow, with 380 people detained Sunday. Police said Zeinalov resisted the SWAT team as they tried to detain him, but no one was injured in the operation. The suspect was detained at a park in Kolomna, where he was waiting for accomplices who had promised to help him escape law enforcement officers, a Moscow police source told RIA Novosti. Zeinalov was transported to the capital in a helicopter and taken to a temporary detention facility. His landlord – who helped law enforcers track down the alleged killer - will receive the 1 million rubles (US$31,000) earlier promised for information about the suspect, the Moscow police press service said. Russian Investigative Committee spokesman Vladimir Markin said “there is no doubt” that the detainee is exactly the person who committed the high-profile murder and that he will be punished. Zeinalov denies any involvement in the crime and investigators may organize an identity parade with a witness of the killing, Markin added. However, police say that “in unofficial conversation” with investigators, the alleged murderer admitted his guilt. Investigators plan to ask the court for Zeinalov's arrest on October 16. It is alleged that Zeinalov stabbed Shcherbakov to death late last Thursday, when the young Russian man and his girlfriend were on their way home in Biryulyovo. Shcherbakov’s girlfriend described the attacker as a male native of the Caucasus and said that he had assaulted her boyfriend after trying to harass her. Later, police published a photo of the suspected killer made from a CCTV screenshot. On Saturday, a group of about 40 people gathered for a protest in the area, urging the police to find and punish the attacker. They demanded that the district’s police chief resign, and that a local vegetable warehouse where many migrants work be closed. The protest was followed by an unsanctioned anti-migrant rally on Sunday, which turned violent as hundreds of angry protesters – a mixture of local residents and nationalists – smashed windows in a shopping mall, turned over vehicles and rubbish tins, and attacked a warehouse run by natives of the Caucasus. The brother of Shcherbakov, Anton, asked people to refrain from provocations and conflicts with police. “I don’t want Egor’s name to be used by third parties for some unclear purposes. I want to problem to be solved within the frame of the law,” he told ITAR-TASS. Earlier, Egor’s girlfriend also said that she was against mass riots and did not want “interethnic conflicts” to be inflamed. The protest on Sunday was the worst to take place in Moscow since a nationalist rally on December 11, 2010. Back then, several thousand football fans gathered on Manege Square near the Kremlin to commemorate the death of Egor Sviridov, a Spartak Moscow supporter. The 28-year-old was shot dead in a brawl by a group of men originally from Russia’s North Caucasus. However, what started as a peaceful protest turned into a violent rally as soccer supporters and nationalists clashed with police. Dozens of protesters were detained. Following the Manege Square incident, authorities stepped up the fight against extremism and xenophobia and toughened punishment for organizing illegal immigration. However, the situation still remains tense. Domestic migration has been on the rise in recent years, which often leads to inter-ethnic tensions. Millions of immigrants also come to Russia from former Soviet republics to seek work and a better life. According to statistics announced last spring by the Federal Migration Service, there are over three million illegal immigrants in Russia and 11 million legal visitors. However, unofficial estimates put the number of illegal immigrants at 10 to 12 million.